I don’t know whose idea it was at Crystal Lake Publishing to try and blend together the concept of Lovecraft and traditional fairy tales and folk stories, but whoever it was ought to get a commendation, because it has resulted in one of the most enjoyable, original and well-executed anthologies that I’ve read this year – and I’ve already gone through a lot of them as the reviews on this blog can attest. Twice Upon An Apocalypse: Lovecraftian Fairy Tales gathers together some of the best writers in the Mythos genre, as well as some brilliant newcomers to the genre, and tasks them with taking those traditional fairy-tales – the Brother Grimm and many, many others – and giving them a uniquely Lovecraftian twist to create a collection of short stories that are original, engaging, often darkly humorous, and always, always grim, dark and horrifying in nature. While I’m writing up this review because author William Meikle has a story in the anthology, and I’m therefore making it part of this blog’s #MeikleMarch month-long focus on titles by Mr Meikle, Twice Upon An Apocalypse has been on my short-list of books to read for a long while, and I’m therefore very happy that I’m able to get around to reading and reviewing it. It first caught my eye because – as has become what feels like a constant refrain in my reviews on the blog – the cover art grabbed my attention and stopped me scrolling past it in the list of genre titles. 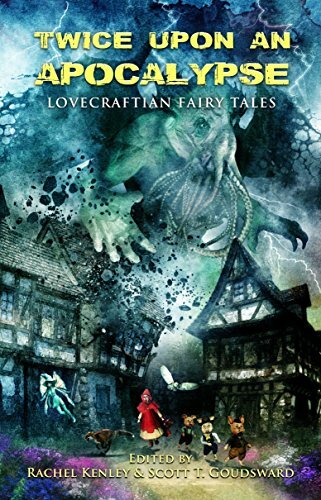 By illustrator Ben Baldwin (www.benbaldwin.co.uk), the cover art has a rampaging Cthulhu smashing apart several Germanic, Grimm-style houses, while in the foreground a variety of fairy-tale characters like Red Riding Hood and the Three Little Pigs are trying to flee the destruction. It’s a great piece of cover art and is really evocative of the theme of the anthology, and sets the stage for the stories that follow. Moving to the contents of the anthology themselves, it collects together a total of twenty-one short stories, which is an impressive number and above-average for the amount of tales you see in collections like this. It kicks off with a very strong start from William Meikle’s story The Pied Piper of Providence which takes the classic tale of the Pied Piper and a village plagued by rats. However the rats are much more vicious than in the fairy tale, spreading rapidly and eating through foodstuffs before going so far as to devour people. Eventually the townspeople are granted a reprieve by the arrival of the mysterious Piper, who does indeed get rid of the rats, although unlike the original story, he leads them into a portal that can only be described as hellish in nature; and when the Mayor refuses to pay the Piper, he unleashes a terrible fate on the children of the town, and the Mayor’s child in particular. The ending is particularly chilling, hinting as it does at the Piper’s vengeance spreading world-wide. This is then followed by The Three Billy Goats Sothoth by Peter N. Dudar, which I think is probably my favourite of the entire collection; it’s a brilliant re-imagining of the classic, placing the troll under the last bridge left intact after the arrival of the apocalypse, and casting the three goats as the Heralds of the Old Ones who are attempting to lead the last shreds of humanity across the bridge to act as a future sacrifice. The language and pacing are perfect, and the humour dark as hell; I particularly enjoyed the stubbornness of the troll, as Dudar gives it very good reasons for that stubbornness, and why it doesn’t want the goats to cross the bridge. Moving through the anthology, I also enjoyed The Horror at Hatchet Point, a retelling of Rumpelstiltskin by Zach Shephard which significantly amps up the horror quotient and turns an already dark story to something practically opaque, in a tale which fleshes out the Rumpelstiltskin character and makes him a genuinely disturbing character, and one to be feared. The Most Incredible Thing from the pen of Bracken McLeod, is a retelling of a Hans Christian Anderson tale that I hadn’t come across before, but McLeod delivers an almost dream-like tale of a bizarre reality show and a disturbed contestant who’s sure that his ‘act’ will not only win the show, but quite literally change the world. There’s some fantastic descriptive prose in the story, especially when the narrator’s gadget is revealed, and it’s an enjoyable story. And I can’t not mention Let Me Come In! by Simon Yee, a twisted, post-apocalyptic, cyberpunk retelling of the Three Little Pigs, which has an almost cartoonish feel to the interactions between the Pigs and the Wolf trying to enter their houses, as well as a backstory to the apocalypse which just begs to be expanded upon. Also notable was The Fishman and His Wife by Inanna Arthen which recasts The Fisherman and His Wife into a cautionary tale of greed and avarice in a world where the Deep Ones overran humanity, and only a few humans survive as ‘servitors’ of the Old Ones; the protagonist is one such servitor, high-ranking in nature, but egged on by his wife to try and gain more and more advantages over the rest of humanity until, as always with these tales, disaster eventually befalls them. Veteran Mythos writer Pete Rawlik delivers a typically imaginative and mind-bending take on Red Riding Hood with The Gumdrop Apocalypse, which recasts the fairy tale into the world of Unknown Kadath, with Red Riding Hood, the Lumberjack and the Wolf fleeing the appearance of Shub-Niggurath. Kadath and the city of Ulthar get comprehensively trashed during a fight that takes some cues from Hollywood blockbusters like Godzilla and Pacific Rim, before the story delivers an intriguing twist that I’d like to see followed up on in a future tale by Mr Rawlik. Nearing the end of the collection, Once Upon A Dream by Matthew Baugh is a great retelling of Sleeping Beauty that casts Cthulhu in the starring role as the dreaming princess, with a darkly amusing riff on the usual course of that love story, and Donkeyskin is a stomach-wrenching tale by K.H. Vaughan that doesn’t skimp on the gore or the psychological trauma inherent in the original fairy tale. The stories I highlighted in the previous paragraphs were ones that I particularly enjoyed and felt were notable, but all of the tales within Twice Upon An Apocalypse impressed me with their high-quality writing, even pace and a remarkable range of imagination in recasting these old tales. It was a hugely enjoyable anthology to read and review, and should be seen as a credit to the authors, editors and publishers involved in its creation. I can only hope that, before too long, Crystal Lake follow up with a sequel that can provide more Lovecraftian horror twists on other fairy tales.